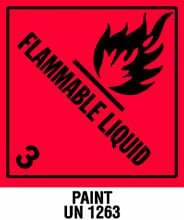 Department of Transportation Flammable Liquid with Note - Paint Class 3 pre-printed warning labels. 4" x 4 3/4" Cleaning Comp. Liquid, NA 1133 on Gloss Stock. 500 per roll on 1" core. 4 rolls/case. To bring you our best price minimum purchasing requirements may change without notice. Please call for the most up-to-date pricing on this item. 4" x 4 3/4" Cement, NA 1133 on Gloss Stock. 500 per roll on 1" core. 4 rolls/case. To bring you our best price minimum purchasing requirements may change without notice. Please call for the most up-to-date pricing on this item. 4" x 4 3/4" Paint Related Material, NA 1263 on Gloss Stock. 500 per roll on 1" core. 4 rolls/case. To bring you our best price minimum purchasing requirements may change without notice. Please call for the most up-to-date pricing on this item. 4" x 4 3/4" Adhesive, UN 1133 on Gloss Stock. 500 per roll on 1" core. 4 rolls/case. To bring you our best price minimum purchasing requirements may change without notice. Please call for the most up-to-date pricing on this item. 4" x 4 3/4" Resin Solution, UN 1866 on Gloss Stock. 500 per roll on 1" core. 4 rolls/case. To bring you our best price minimum purchasing requirements may change without notice. Please call for the most up-to-date pricing on this item. 4" x 4 3/4" Gasoline, UN 1203 on Gloss Stock. 500 per roll on 1" core. 4 rolls/case. To bring you our best price minimum purchasing requirements may change without notice. Please call for the most up-to-date pricing on this item. 4" x 4 3/4" Insectitide Liquid N.O.S, NA 1933 on Gloss Stock. 500 per roll on 1" core. 4 rolls/case. To bring you our best price minimum purchasing requirements may change without notice. Please call for the most up-to-date pricing on this item. 4" x 4 3/4" Flammable Liquid N.O.S. UN 1993 on Gloss Stock. 500 per roll on 1" core. 4 rolls/case. To bring you our best price minimum purchasing requirements may change without notice. Please call for the most up-to-date pricing on this item.